UEFA has announced the prize money pool for 2017-18 Champions League season and around €1.3 billion will be distributed among Champions League participants from qualifying rounds to the final. Last year Real Madrid beat Juventus in the Final of 2017 Champions League to retain the title but it was Juventus who took home bigger chunk of Prize Money. Real Madrid made around €89.5 million (thats €54.2m in performance based money and another €35.3m in market pool) While Juventus pocketed €101.1 million ($50.6m in market pool and another €51.1m performance based). 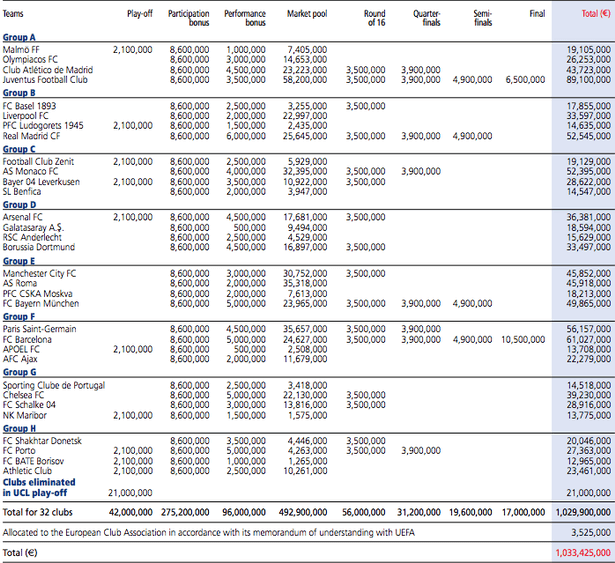 Below is the entire breakdown and explanation on how UEFA distribute Champions League tv money. UEFA has announced several major changes ahead of the 2017-18 Champions League season and that includes increase in prize money plus 15% increase in TV market share for premier league teams. We take a in-depth look at how UEFA distribute champions league revenue among teams across whole Europe. Distribution system explained: The estimated yearly gross revenue from all UEFA competitions (Champions League, Europa League, UEFA Super Cup) is centralized and placed in 1 pot. UEFA estimates around €2.35 billion to be generated in 2017-18. From central pot 12% (€282m) is deducted by UEFA for Admin and competition costs another 8% (€199.7m) is used as solidarity payments to clubs and national FAs. 2017-18 Prize Money Fund: UEFA Champions League is by far the highest prize money paying competition in the world, yeah thats right even more than Football World Cup and for 2017-18 season we see another 10% increase compared to 2015-16 season where €1.257 billion was distributed among teams in champions league from playoffs to the winners. 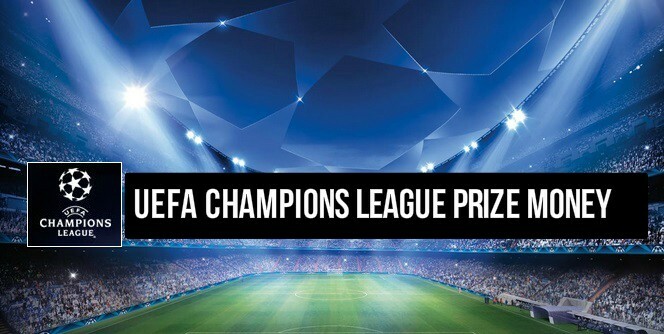 We take a look at this years champions league funds and how they will be distributed. So how does the distribution of €1.3189 billion works among Champions League participant and teams who play in Champions League qualifiers but fail to reach group stages. The total prize money pool (€1.3189 billion) is divided into two portions. A). Fixed Amount (€761.9 million) awarded according to how the teams finished and performance related bonuses. B). Market Pool (€507 million). Part of UEFA’s TV income which is distributed according to which league the team comes from and number of matches played by a team in 2016-17 Champions League season. Playoff Bonus €50 million distributed to 20 teams who participated in playoffs. €2m each for playoff winners and €3 million each for eliminated teams. UEFA has announced €507 million in market pool money for each of the next three champions league seasons. Which will be distributed according proportional value of each TV market (Country/League). So the market pool awarded to each country’s league will be distributed among the teams from that league according to their performance in previous league season and how many matches they will play in the given champions league season. English clubs will benefit the most with the new Market Pool distribution system and If an english club were to win the champions league in 2017-18 season they will earn more than €110 million (around €55m from performance based + another €50m/€60m with market pool). If FC Basel were to win the Champions League they won’t make as much as Real Madrid or Barcelona did in the last couple of years. Why ? because of the market value of the team. Teams coming from top 4 European Leagues get the bigger chunk of the market pool. Every League (not teams) gets specific market pool money according to the UEFA Ranking of European Leagues, and for example last season from Spain Atletico Madrid, Barcelona, Real Madrid and Real Sociedad played in group stages so the total market pool for spain was shared between four teams. Where Barcelona got €24.6 million, Real Madrid €20 million, Atletico got €17 million and Real Sociedad got €8.5 million in market pool money. Juventus on the other hand got massive €58.20 million from market pool money because only them and AS Roma from Italy played in the group stages and Roma knocked out in group stages leaving Juventus with huge portion. So the Market Pool given out to other low ranked leagues like Ukraine, Russia etc is much lower so the clubs from those countries get less money even if they over achieve and qualify for the later stages of the champions League. How much Real Madrid and Liverpool are expected to earned for their 2017-18 Champions League run ? Real Madrid are playing Juventus in the final of 2018 Champions League, looking to retain the title and set to pocket around €89.5 million from their 2017-18 european campaign. While Juventus will be making around €101.1 million more than Madrid because of bigger chunk of italian market pool money going Juventus way. Real Madrid will earn around €35.3 million in market pool money plus €55.7m in performance based money if they win the 2018 final elevating their total to a massive €90.8 million. Following table shows how all the 32 participating teams were paid in prize money, performance bonus and market pool money. The scary moment of the UCL final match between Barca/Juve was when Luis Suarez gave Mitchel Platini a hug , I was so nervous not see Platini screaming at the top of his voice for help !!!! 3 days have passed, and no one found your comment funny. EISH! We worn and it is the most important thing.Let haters nurse thier anger. Premier league is the biggest league in the world. Even better than champions league but according to the name champions league it suppos to be the richest league. But, why is premier league more money than champions league? Premier league is more conpetitiful.